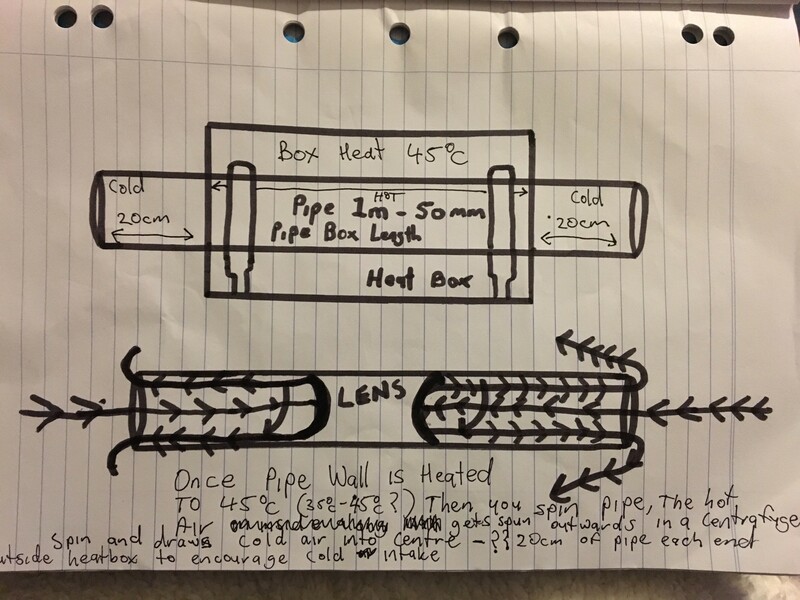 When pipe is heated first ,then spun ,the hot air is spun outwards inside the pipe and then pumped out of pipe along walls causing cold air to be drawn in centre creating a lens, a descent section of pipe on each end is needed to separate ends of pipe from heat so cold air can be drawn in ? That is not quite what happens. Air has poor thermal conductivity. 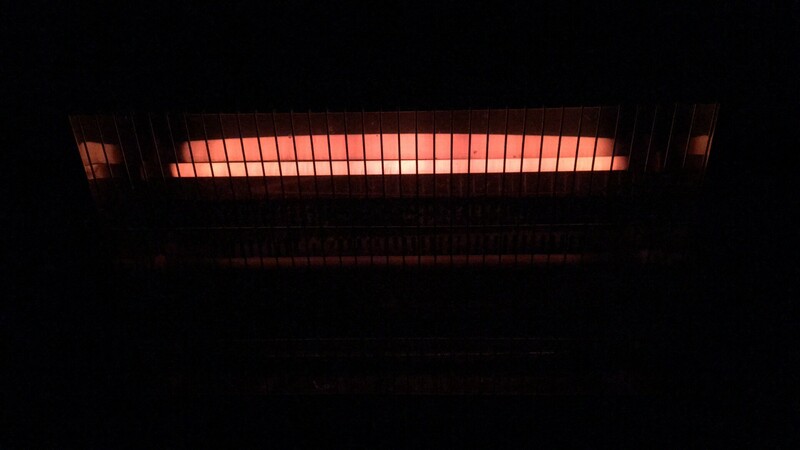 The film of air in contact with the inner surface of the heated tube warms up. Hot air being lighter spills out of the edge of the tube. Cooler, denser air from outside enters the tube to replace the lost warm air. A centrifuge pushes denser components outward. Lighter components will actually migrate to the centre. That is what happens with centrifugal settling. In an open tube the lighter hot air in contact with the hot inner surface gets squeezed out by the denser cooler air being pushed out to the surface from the axis area. Higher the speed more will be the squeezing action. At this point the rate of heat transfer to the air gets into the picture. Since the heat transfer coefficient to a poor conductor like air is small, a limit to the spinning speed may be reached because the air film is not getting hot enough to be pushed out. Nichrome heating tubes are available. 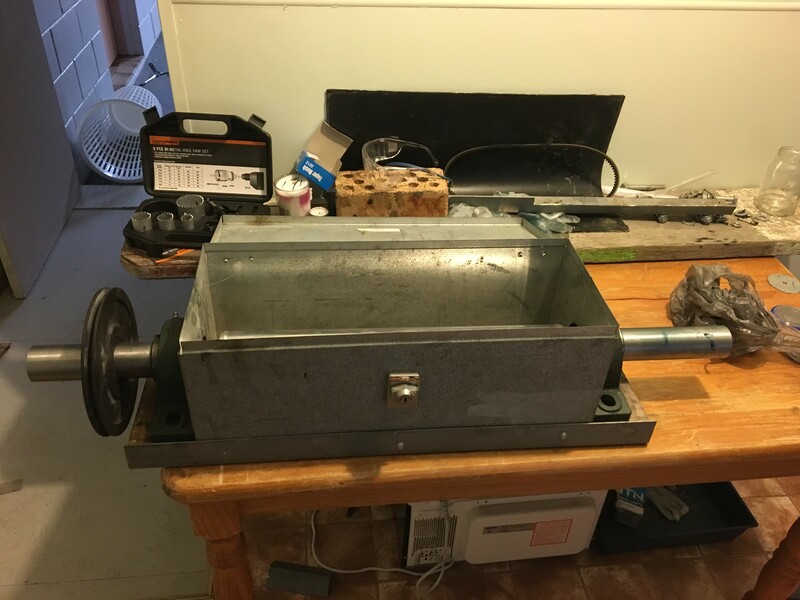 I maybe simplest to use a box around the tube to the required width with an inlet and outlet.There is a slew of temperature controlled hot air blowers (even a hair dryer would suffice) available. The tube can pass through circular holes in some fluoro-elastomer sheets (Fluoro-elastomers for low friction) to contain the hot air in the warm zone. The total outlet area can be higher than the inlet to minimise leak at the seal points. While one can optimise power for the heater, it will be any way small and not worth the effort and cost of doing it. Thankyou my friend, Will use these in my new one if tests work.. 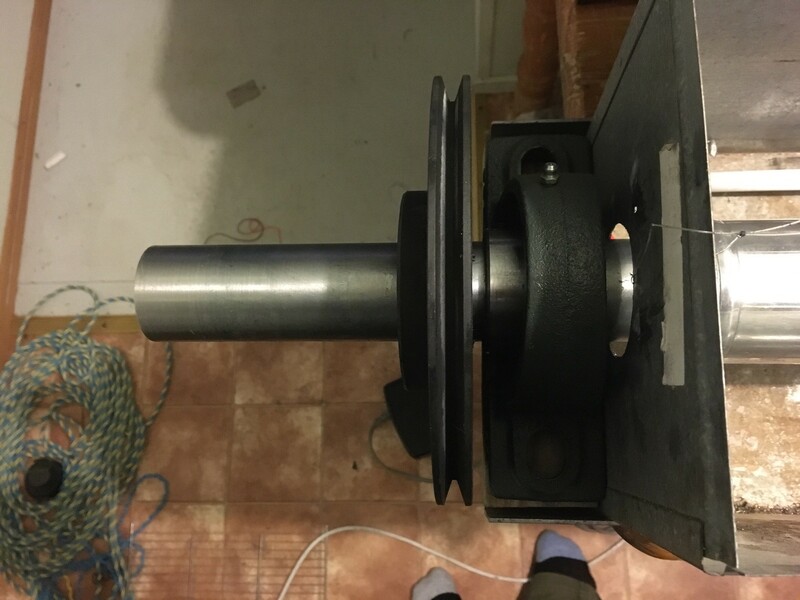 Instead of a metal box one can use a PVC or acrylic pipe (available in many diameters at any hardware store) as the hot chamber. A bonus is that they are thermally insulating. The tube in the picture looks more like 2 inch diameter.